If you are looking to write a covering letter to support your CV in application for the role of Transport Coordinator then you need to go through your CV and write your letter based around your previous work history and what skills they have asked for in their job advertisement so that these elements stand out in your covering letter as this will then entice them to read your CV and hopefully invite you to an interview. 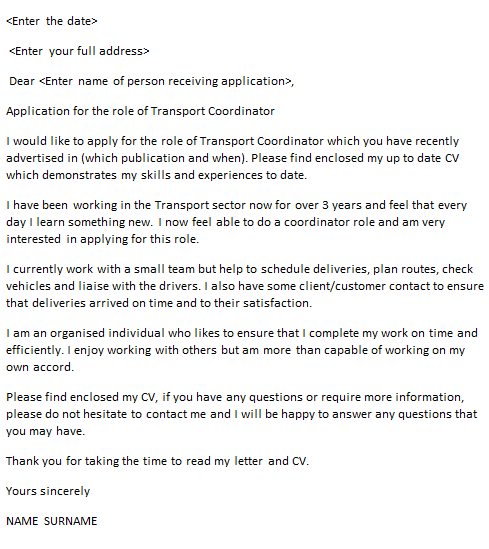 I would like to apply for the role of Transport Coordinator which you have recently advertised in (which publication and when). Please find enclosed my up to date CV which demonstrates my skills and experiences to date. I have been working in the Transport sector now for over 3 years and feel that every day I learn something new. I now feel able to do a coordinator role and am very interested in applying for this role. I currently work with a small team but help to schedule deliveries, plan routes, check vehicles and liaise with the drivers. I also have some client/customer contact to ensure that deliveries arrived on time and to their satisfaction. I am an organised individual who likes to ensure that I complete my work on time and efficiently. I enjoy working with others but am more than capable of working on my own accord. Please find enclosed my CV, if you have any questions or require more information, please do not hesitate to contact me and I will be happy to answer any questions that you may have.